This book was the August pick for the book club that I started going to, like I need more opportunities to read books on a deadline. It's a sci-fi book club, so this one won out because of the time travel elements, but also due to the fact that it's set here in Chicago. Kirby is an interesting character. She's hard to like sometimes, but interesting to read about. She's damaged, and some of that damage was done long before Harper ever entered her life. She's determined to find the man who tried to kill her, even if that means finagling her way into an internship at the Sun-Times at the sports desk, just to get close to Dan, who originally wrote about her attack. She makes a lot of rash decisions and is trying to take control of her life again, so I liked the times where she got to have some agency of her own rather than just having things happen to her. Harper is basically a terrible human being. The author has said in interviews that she wanted to do something different than the popular media's take on serial killers: the sophisticated, brilliant Hannibal Lecter; or Dexter Morgan, who kills people who have killed others (for the most part). Harper isn't like that, and as I was reading, I thought about the ways we've made terrible people like this into anti-heroes in fiction. Unfortunately, though we spend probably half of the book reading from Harper's perspective, we never fully understand his motivations to want to kill Kirby and the other "shining girls", which disappointed me. 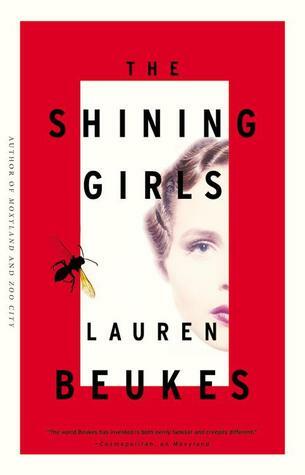 The whole concept of the shining girls was vague and something we discussed at length in the book club -- what made these girls shine? why them? was there a theme or a pattern, or was it just random? Every time you thought there was a pattern, you would meet a girl who didn't fit it, or Harper's actions would deviate from the expected. Was he just crazy and making up reasons to kill them? You never really know. I enjoyed this book but ultimately felt a little unsatisfied. There are a ton of red herrings in the form of information given out that seems like it's important but never actually comes up again. I don't usually try to read with an eye towards picking out foreshadowing -- it annoys me when I can guess a book's plot before I actually get there -- but some things really stand out, and in most cases here, they stood out for no real reason. The Shining Girls is a character study as much as it is a sci-fi story, and while the author is very careful about closing all of the loops created by the time travel aspect, I do wish that some elements had been a little more explained. I can accept a lot of things on faith because you need to accept them in order for the story to work, but I wish that either a little more had been explained about Harper and the House, or that it hadn't been explained at all. There's some throw-away information at the end that tries to explain it, but it felt flat and a little too esoteric for me. Despite the fact that this is a book about a time traveling serial killer, it's otherwise entirely grounded in reality. Harper has no special powers, he's not charming or handsome or especially smart. He's just very good at murdering people. But then a few hints and lines try to explain the House and it suddenly takes on a paranormal aspect that I didn't like. The author did a ton of research to get Chicago right, and everything felt fairly accurate to me, but also felt like she was hitting check boxes of "great Chicago things to write about". World's Fair? '68 Convention Riots? The curse on the Cubs? Cabrini-Green? The flood in the Loop in the '90s? Check, check, check. The facts were there, but the story didn't feel like Chicago. That's something intangible that I can't quite put my finger on, but something just feels different when I generally read books in Chicago by Chicago natives. It's certainly not a downside to the story, just something that I noticed, and would be interested to hear from any other Chicagoans who wind up reading this one. There are some scenes of very graphic violence in here, both towards people and animals, some sexual situations, and cursing, so I would recommend this for adult readers.